The Sailortown galleries, at the Museum of London Docklands, recreate the environment of a bustling Victorian Wapping for visitors to explore. 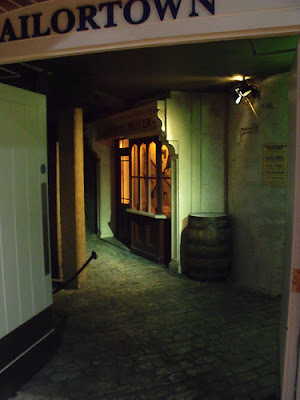 Designed to reflect the winding lanes of Wapping between 1840 and 1850, Sailortown is found on the second floor of the Museum, and features a public house, lodging houses, a chandlery and even a wild animal emporium. This is my favourite exhibit in London! You can hide in an alleyway and pretend you're a docker! I adore the Museum of London - it's my favourite. Ali, you do know what dockers used to get up to in dark Victorian alleyways don't you...? I recently visited the Docklands Museum and I think the Sailor town exhibition was my favorite. i love walking through scenes rather than just looking at things through glass. Go along if you get the chance.